Thornton Wilder’s Pulitzer Prize winning play Our Town has come to Perth under the watchful eye of Black Swan State Theatre Company’s artistic director Clare Watson. 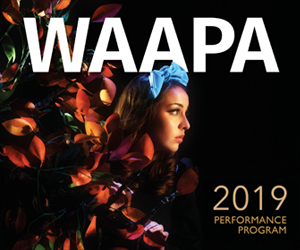 This season of Wilder’s 1938 work is one of ten local productions under the Made in WA banner in Wendy Martin’s fourth and final Perth Festival programme: a line-up that champions the wealth of creative talent in our own backyard. Although set in the fictional American town of Grover’s Corner, Our Town has maintained appeal the world over for the last eight decades because of its lasting relevance. The minutiae of the day-to-day and the themes of life, love and death are universal and timeless. But Black Swan’s production provides an extra layer of relatability for its home-town audience. It’s intrinsically linked to our city. Watson has cast Ian Michael, a Nyoongar man, in the lead role of Stage Manager in this metatheatrical piece. Addressing the audience and carrying the narrative with grace and a dash of cheekiness – as well as playing one of the characters – Michael has a charming stage presence that’s impossible not to enjoy. Michael is one of three professional actors in Our Town, alongside Shari Sebbens as the stoic Mrs Gibbs and Abbie-lee Lewis as the delightful Emily. To make up the rest of the cast, Watson has invited members of the local community to share the stage. The milkman and his horse Bessie are played by your friendly Uber Eats courier and his bicycle, ice cream sodas are delivered by the conveniently located Chico Gelato. A local doctor, undertaker and priest fill those roles… and so on. There’s a danger of wooden acting and dull dialogue but instead, the community members shine, adding a realness (and a heap of fun) that does justice to Watson’s ambitious vision. Given Our Town‘s famously stark set – an Australian souvenir tea towel is both an Antipodean touch and a rare prop – the weight of the play sits even more firmly than usual on the shoulders of the performers, heightening Watson’s risk… but it works. As I sat outside in the State Theatre Centre Courtyard, the summer night feeling like a warm blanket around my shoulders and the sounds of Northbridge in the background, I couldn’t have been anywhere else in the world. And I wouldn’t want to be, either. Our Town might be about every town, but this production is ours, and it’s something to be proud of. Our Town plays the State Theatre Courtyard until February 23. Picture top: Ian Michael and Shayani Galhenage. Photo: Daniel J. Grant.